So on the weekend, I read Vincent of Lérins’ Commonitorium. This fifth-century (ca. 432-440) text is famous for stating that catholic truth is that which has been believed always, everywhere, by all. This is probably all most people ever hear about the text, quoted with swelling chest by a certain breed of traditionalist, queried with raised eyebrow by those who are pretty sure this is a pretty useless approach to finding truth in real life. I, personally, was more interested when he got talking about Christology. (No big surprise there!) 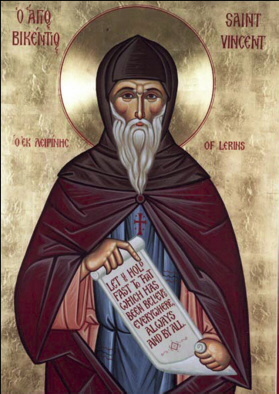 But, since Vincent is more famous for his quest for catholic truth, I’ll write a pair of posts about the Lerinian monk, starting with the quest for orthodoxy. First, the early fifth-century context. I’ve written about it a bit more fully here, but what you need to know is that monasticism is kicking off in a big way in southern Gaul (southern France) where Vincent lived, a few decades after the death of St Martin up north in Tours (Tours, on the Loire, is on the cusp of northern Gaul — they still have wine, though!). The island of Lérins (near Cannes and the beach) was a major centre for the ascetic life, and several Gallic bishops started off their ecclesiastical careers as Lerinian monks. Down the coast from Lérins is Marseilles, and around this time John Cassian’s famous works on the ascetic life were being published. The predestinarian debate is going on in Gaul, starting to enter the phase where people we today call ‘semi-Pelagian’ are being challenged for not being Augustinian enough, including Cassian, Vincent, and the future abbot of Lérins and bishop of Riez, Faustus. Fun fact: All three are saints, so maybe we should cool our heresy-hunting predestinarian horses. Anyway, this debate leaves little trace in Vincent. Vincent is more concerned about Christology. Off in Ephesus, the Bishop of Constantinople, Nestorius, had been condemned as a heretic in a council led by Cyril, Bishop of Alexandria, about which Vincent has knowledge. The condemnation of Nestorius at Ephesus in 431 is not, of course, the end of the story, not even for the 430s. Various letters are going back and forth, East and West, about the easterners who reject Cyril’s council, until a reunion between Alexandria and Antioch happens in 433, although there’s still some simmering on both sides afterwards. Anyway: Orthodoxy. How do we know it? Obviously, it’s a hot topic in Vincent’s day, all this talk about predestination and whether Jesus was two persons or not. The two most important things for Vincent are fidelity to Scripture and fidelity to tradition (ch. 4). He argues for the importance of tradition on the grounds that most heretics use the Bible in their defense (ch. 5). Even in small disputes, this is worth noting, as when I explained to a Presbyterian friend that episcopal hierarchy isn’t actually contrary to Scripture. (By ‘small’, I mean Presbyterians aren’t heretics.) The appeal to Scripture alone doesn’t necessarily help you against the Arian or the Origenist, does it? Thus: Tradition! Vincent goes on to demonstrate times when you lean on antiquity when confronted by error and times when you put your weight on the testimony of the majority. He demonstrates novelty with the examples of the Donatists and Arians. The modern historian will point out that Donatists and Arians would claim that they taught nothing novel, but I do think that pure Arianism, in fact, by stating its case baldly, is a departure from antiquity, from the liturgical expression of the Church, from the (at leas) binitarian nature of biblical worship. Donatism is actually a better example of the minority. If all the churches of the Mediterranean except for a small number in Africa go one way, are we to believe that the Africans are right? Of course, what about that time everybody was (semi-)Arian after the council of Rimini? Well, that’s why antiquity also helps. Hold them in tension, you should be able to figure it out. Vincent also talks about why and how heresies arise. Why? Heretics are God’s way of testing the church. They are also a reminder not to be proud. Even Origen and Tertullian fell, after all. How? By not holding fast to antiquity, universality, and consensuality. By trusting in their own cleverness. Through pride. This is how heretics arise. It’s a worthy warning for we who think ourselves clever when he pulls out Origen and Tertullian. Now, we may want to nuance both of these condemnations. (Like, was Tertullian actually a Montanist?) But still. We shouldn’t be over wise (Ecclesiastes 7:16). The question is: What does all of this have to do with us? First, we don’t have to reinvent the wheel. The consent of the 318 fathers at Nicaea, for example, when coupled with First Constantinople, First Ephesus, and Chalcedon, should have some weight in the question of, ‘Is Jesus fully God?’ We don’t have to recreate the doctrine of the Trinity from scratch — Athanasius, Hilary of Poitiers, and the Cappadocians have already been there and done that. But Vincent’s approach does leave room for exploration. He has this idea of putting together your own little anthology of patristic greatest hits to help you on your way. (I suspect that this is what his Excerpta are.) He wants his readers to be delving into the works of the Fathers, not simply accepting the dogmatic formulae of the councils. Second, this approach helps us test new-seeming ideas. I’m too tired to articulate anything here. Sorry. The general idea is: Test the spirits. Use Scripture and tradition as tools when you come up against something you aren’t sure about. Does it fit in the picture frame of the statements from the councils? Can you find it in older writings? Is it counter to older writings? Do a lot of people in your communion believe this? Finally, I don’t think it will work beyond the individual believer, because I’m an Anglican from Canada. I’ve already seen schisms in my lifetime because some rejected universality, others antiquity, and no consensus was available.